Once you made your way down the hill and into the cave (32.7 45.3). You must turn each ring to line up the icons on the rings with the icon on the rocks and then you can click the device in the middle. Be careful to not accidentally click on a ring you aligned, otherwise a slow process to realign it. March 4, 2015 - Upon completion of this quest, I was only awarded 150g 22c, and not a relic purse as stated on this wowhead page. This quest is a pain if there are other people there who don't understand how the symbols are supposed to line up. Anyone on the quest can spin the rings, so good luck lining them up when someone else decides to spin random rings without understanding what's going on. Just in case someone doesn't get it... you're supposed to match the symbols on the rings to the symbols on the stones. Upon lining the rings up properly, those of us in the cave were still unable to loot the item - but then someone else ran in and looted it right off. We left the cave, making sure to go far enough out that the zone changed, and re-entered. The 'properly activated' visual immediately triggered for each of us and we were able to loot. TL;DR: if you can't loot the crystal even when the runes are aligned, run out and back in. The cave entrance is not at the very bottom level of the hill; here's a screenshot showing landmarks near the entrance. Note that it's near the edge of a cliff, and farther down is a bunch of cult stuff. 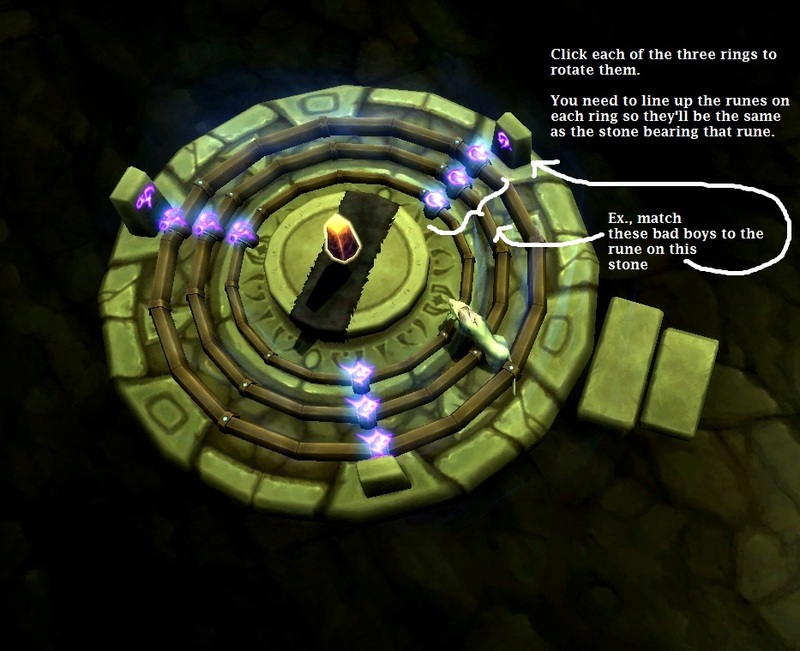 Once inside the cave, here's how you should line up the runes on the rings. At least this is what worked for me. When lining up the ruins be sure that each ring's image lines up and matches the image on the 3 stone pillars. That kind of tripped me up a bit till I looked down at the rings from overhead. Look at the wooden tracks the purple crystals are on. There is NO little blue crystal to the direct RIGHT or LEFT of ONE of the purple crystals on each track. Line those 3 up with the rune stone on the left of the steps and bam, done. This quest was bugged for me and wouldn't complete the artifact. I logged out, abandoned the quest twice, tried running out until the zone changed, nothing. Finally I used the custom raid finder to join someone's garrison group and when I switched realms, I lined up the runes and it finished. Something to try anyway if you're banging your head like I was. It's my last one for Harrison as a follower so I was getting pretty fired up. Has anyone else not gotten this in your garrison yet? Or am I looking in the wrong place? Since Harrison has been able to show up in the garrison to offer these quests, I have NEVER gotten this one once. And its the only one I need... any clue? Tips? this was hard for me to find..
i ended up at the terrace of stars. When i got my back to the stair i went right for about 5 seconds, just down the hill, and then the cave is on your right side! i ended up at the terrace of stars. i jumped and took the path to the right, and there was the cave, on my right. get into the cave and it counts for that it allows me to place the crystals but will not allow me the credit for aligning them. help please? Thank you. You have to jump down into Shadowmoon Valley zone to a level where you can't get back up even if you wanted to--but won't need to. I kept looking endlessly up higher because I expected it to be in the same zone and didn't want to jump down just to get stuck and have to go all the way back around and up. Only reason why I even chanced it was because the screen prints posted made it obvious that it was the only possibility. If it helps, it's on the paved level that has the altar with a ring of purple flames around it where Yrel's(?) sister died way back when we came to rescue her at level 90ish (alliance). I hope this helps and alleviates any of the frustration I experienced, not to mention the life-like vertigo. This quest was very bugged for me. At the very end I would line up the symbols correctly, but nothing would happened. I hopped on at least a dozen different servers, and the puzzle would light up the crystal would form, but I couldn't collect it. It took a couple of days for a GM to respond to my ticket but they flagged me as completed. I included in my ticket screenshots of each bugged step. To be honest I don't even know if I got the gold for the reward but at this point it didn't matter. I also told them I turned off all my addons to no avail. Very frustrating. 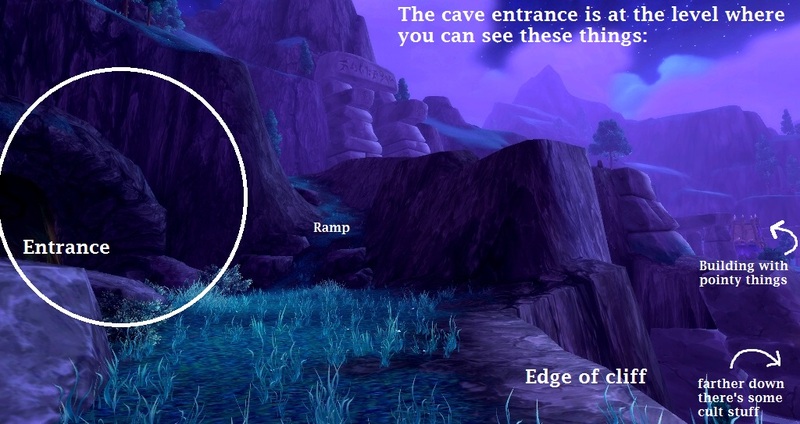 If you fly into the Cave the step "find the reconstruction device" might not complete. Walking in and out of the cave and relogging did not fix it for me. The quest can be completed nonetheless. Aligning the crystals correctly and looting the dream marked all parts as completed and it could be turned in. O cristal draeneico foi restaurado? Isto é incrível! Eu jamais diria que este cristal esteve quebrado! Tenho certeza de que o Dr. Jones vai gostar de ver isso, bem como os draeneis, se as histórias forem verdadeiras.